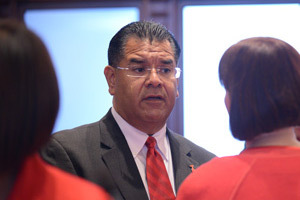 Illinois State Senator Martin Sandoval (D-Chicago), Chairman of the Senate Transportation Committee today announced he will hold a committee hearing next Thursday, March 13, on a number of public safety questions about new transportation providers in the state of Illinois, including Uberx, Lyft and Sidecar. The purpose of the hearing is to determine what specific gaps concerning insurance and public safety currently exist and how to best implement policies to protect the citizens of Illinois. The committee has invited members of the ride-share community to explain their insurance policies and safety training materials. The Senate Transportation Committee has requested full commercial insurance policies of UberX, Lyft and Sidecar demonstrating they have full commercial insurance as well as copies of all training/safety manuals offered to drivers of these ride-share companies. In addition to the ride-share companies themselves, the committee expects to hear testimony from representatives of the Illinois Department of Insurance, automobile insurance providers, legal experts and representatives of the taxi industry. 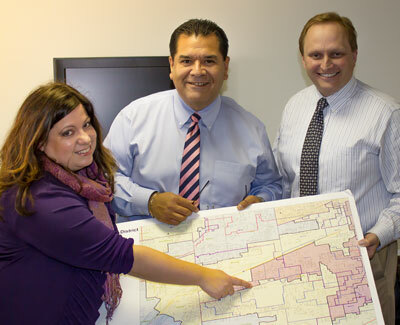 Senate Transportation Chairman Martin Sandoval (D-11) recently met with IDOT officials at his district office in Cicero to go over design plans for a grade separation in the Garfield Ridge neighborhood. The project involved a Preliminary Engineering and Environmental Study (Phase 1) of the proposed improvement of Central Avenue at the BRC Railroad in the vicinity of 54th Street. The most likely improvement scenario will be a grade separation of Central Avenue at the BRC tracks providing two continuous through traffic lanes in each direction and bicycle and pedestrian accommodations along the entire length. The Phase 1 Study includes the preparation of an Environmental Assessment in accordance with the National Environmental Policy Act. “I’m happy to report the design for a grade separation is nearing completion,” said Sen. Sandoval. The proposed improvement will address congestion experienced by motorists on Central Avenue due to train crossing disruptions. In addition, emergency response is compromised during periods of rail freight occupancy. The Phase 1 Study has taken approximately 18 months. Relacionados: El Presidente del Senado de Illinois, John J. Cullerton, advirtió que el estado enfrenta un déficit de casi 3 mil millones de dólares que podría causar dramáticos recortes a la educación, incrementar el costo de la matrícula universitaria y eliminaría los progresos fiscales que se han logrado en los últimos años.